Young voters could play a critical role in the elections, which will determine whether Republicans will maintain their full grip on Congress. But the big question is whether they will show up to the polls. Young voters rarely turn out in numbers that match their share of the population, especially in years when a presidential candidate isn’t on the ballot. John Laubacker, 32, of Rockport, New York, said he was “appalled” by the state of politics heading into the midterm elections. 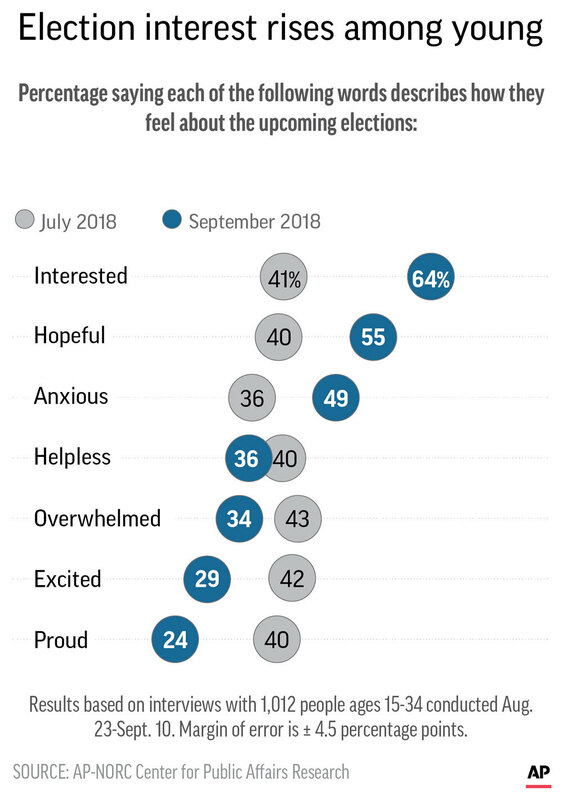 Roughly two-thirds of those ages 15 to 34 now say they are interested in the elections, compared with about 4 in 10 in July. Interest is highest among young Democrats. Seventy-three percent of young Democrats say they are interested in the elections, up from 50 percent in July. A smaller majority of Republicans — 62 percent — say they are interested today, but that’s still up dramatically from 31 percent who said so in July.